Königstein is an ancient fortress on a rocky hilltop near Dresden, Germany. 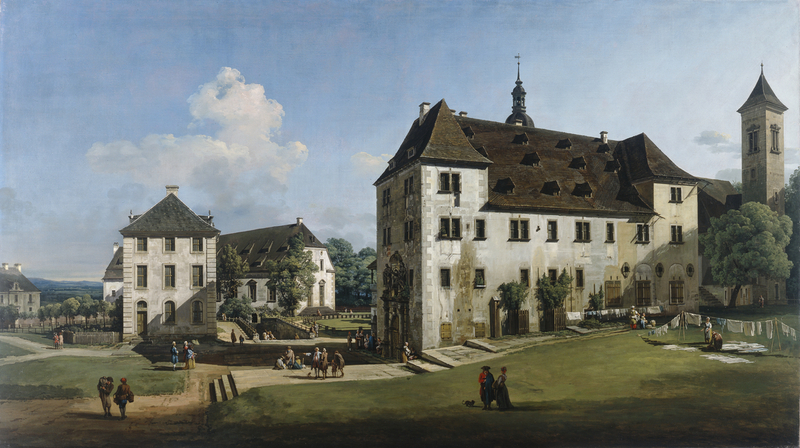 Bellotto was commissioned to record it, in five different views of identical size, by Augustus III, King of Poland and Elector of Saxony as a part of a record of his estates. This view from the south includes several buildings within the fortification: the southern end of the Brunnenhaus facing us to the left, the Georgenburg oblique behind it, and the Magdalenenburg in the foreground. Bellotto's superb architectural record is enlivened by people associated with the estate going about their daily lives, such as the two figures with a small dog and women drying washing on the lawn in the foreground. The paved areas to the left of the Magdalenenburg are scattered with small groups of people, enhancing the idea of the fortress as a thriving community. Bellotto was a nephew and pupil of the celebrated Venetian view painter Canaletto. He often signed his pictures 'Il Canaletto' to draw attention to his lineage, but the addition of more naturalistic details and cooler tones distinguishes his work from that of his uncle.